How To Make Apple Pie Moonshine’s outdoor series part three. Grab your fishing pole, grab the bait, hitch up the boat and grab your Apple Pie Moonshine. The summer is slowly winding down but there is still plenty of time to squeeze in a fishing adventure! With these helpful tips and tricks on how to prepare for the ultimate fishing adventure in these last few weeks of summer. This article will be your new guide for the best fishing trips hacks, inspire you to visit more than just the local pond and then lastly share the best way to celebrate your top catches with Apple Pie Moonshine. While all of the innovative and fancy baits, lures, lines and bobbers all work wonders there are plenty of DIY fishing hacks that save you some money but still get the job done especially in a time of need. Here are just a few ideas that really go above and beyond on the creative and effective fishing hacks. To stay organized string your hooks on a safety pin. Having them all looped together will keep them from getting dangerously tangled. If you happen to lose all of your hooks while out on the water, of course your worst case scenario. Making fishing hooks out of can tabs can definitely be an effective last minute fix. Simply yet carefully cut a section out of the tab. Start with the rounded hole pointed towards you. Then cut one diagonal line starting on the side in between the smaller hole and the rounded hole and then repeat again to relive the whole chunk. Cutting at a diagonal will be key to making the sharp hooked point. Should look something like this. Using a lemon juice bottle as a bobber. The lemon shaped bottle is bright yellow and works like a charm: take the empty lemon juice bottle, open the top. Take your fishing line and draw out enough to mimic a good line toss. Then work your way up to the middle and wrap the line around the top, just above the ridge that begins the bottle and the screw top. Once wound a few times, place cap back on and seal tightly. Ad hook and weights to the end of your line. Boom you have a fresh new fishing bobber. Run out of weights as well? You can make your own weights by securely attaching fowled and layered bits of tin foil to your lines. Making a fishing poll maybe seem like a silly thing to know now, but when worst comes to worst you will be happy to know this simple fix to being able to still enjoy your trip until you can make it back into town to buy a new one. Making a fishing pole out of a simple stick, some line and a hook is much easier then you might think. Take a stick. Start at one end and work your way up a bit till about the usual spot of a handle. Tie a knot at this spot. Then wind the line up the stick towards the opposite end. Tie another knot and then add your hook, bait, and maybe even your bobber. Saving some extra cash and knowing some last minute fixes will ensure a good time no matter what life throws at you. There are countless places all over the US that are well known for catching the best fish but these ten locations are by far the best according to fishing experts just like you. Check out this list of top spots and be inspired to explore beyond your local fishing pond. Glenwood, Springs Colorado. Glenwood is known for the wide variety of day trip fly fishing destinations. With blue skies, canyon landscapes and excellent fishing conditions, Glenwood is “Colorado’s Fishing Hub”. Anglers all over the globe travel to Glenwood to get a taste for the number on spot in the U.S.
Mountain Home, Arkansas. Mountain Home has the best small town feeling of any top fishing spot, not to mention the amazing fishing spots that have some of the world record brown trout catches, large-mouths, walleyes, as well as strippers to name a few. Safe, friendly and appropriately priced makes the perfect hang out after all long day of catching top ranked fish. Traverse City, Michigan. Who doesn’t love catching a great variation of fish in a small amount of time? Traverse City offers so many different types of water from rivers to catch, to pounds to catch some, there are so many ways to spend a quick trip and be sure to make some prize catches. Bozeman, Montana. Bozeman is ideal for river anglers looking to score some great rainbow trout and brown trout. This fly capital laws allow you to wade in most high water ways. The proximity to Yellowstone national park is also a plus for the fishing adventure because you can always go check out the park with the right set of permits. Minocqua, Wisconsin. The countless lakes in the great Midwest do not disappoint when it comes to fishing variety. With over 70 lakes nearby this small fishing is known for their small/big mouth bass and trout as the common catch. Most people around fish all day and sit on the porch at night, wake up and repeat. The ideal spot to embrace true fishing culture of the north woods and have relaxing fishing trip. Apalachicola, Florida. Dip into a bit of saltwater in Apalachicola. This ocean front town will treat you to mass catches of sheep head, sea-trout, and redfish and at their large recreational fishing spot. Besides the great fishing variety is the prime location, away from all the tourist traps, golf resorts, etc., the remote location is awesome for some peace and quiet in the hustle and bustle of Florida. Nantucket, Massachusetts. The original fishing town hit just about everyone’s favorite time of fishing. From fly fishing in June to catch some striped bass to, Surf-casting in fall for large cows, and beach casting can get you some awesome Bluefin catches from April to November. Get some sea water in your veins in Nantucket and you won’t ever want to fish anywhere else. Bend, Oregon. This blossoming outdoors town is home of the great Deschutes River. Deschutes is out of a fairy tale for anglers, offering 3 different sections of fantastic fishing. Brown sleeper trout hang around in the first section in spring, Rainbow trout lay home in the second section throughout the heat of summer, and then lastly the third section is home to warm spring’s steelheads fishery. With great fishing in every season it is no wonder Bend makes the top 10. Guntersville, Alabama. If you are looking for a great Bass fishing spot, Guntersville is your gold mine. Home to Lake Guntersville, the miles of shore line offer the world’s best bass fishing, having held many professional fishing tournaments in its time. This old south town has a love for fishing but is also really easy accessible with its close proximity to Nashville, Atlanta, and Birmingham. Morehead City, North Carolina. Morehead offers the best 360 days a year fishing variety. The coast is famed for its large Redfish surf-casting in the fall as well as its sea trout on shore. If you head out to open water, Marlin, dolphin and even tuna can be caught. If you were to head inland you would find yourself in the middle of bass country. With something for everyone any time of the year, Morehead is a great fishing destination for any fisher. Planning for you fishing trip to fit in this summer should be a bit easier with these last minute gear hacks and now your knowledge of the top ten fishing spots in the US, all that is left is coming up with the right way to celebrate that prized catch this summer. Try out these great cocktail ideas made specifically to celebrate a good day of reeling ‘em in. Adding a batch into a mason jar and tossing it in your cooler is a simple way to go about enjoying your favorite shine but you can always take it to the next level and make fishing a bit more fun with these simple mason jar cocktail ideas. For the heck of it lets call ‘em “Fishtails”. Add fresh Cherries to the bottom of a mason jar. Add a couple ice cubes. Shake the jar. Pour Apple Pie Moonshine over the top and then add some lemon lime soda. Add about 2 oz. of Apple Pie Moonshine to a Mason jar. Pour in ginger beer and ice. Add mint leaves and 2 slices of lime. Add 1 cup chopped apples to a mason jar. Pour in Apple Pie Moonshine to desired limit. There are so many good ways to enjoy Apple Pie Moonshine, check our other cocktail ideas here. Please enjoy responsibly out there on the water. 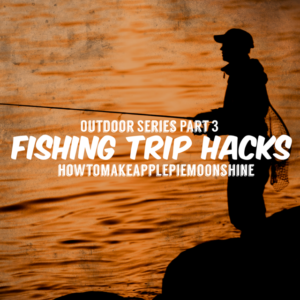 Now you know all the best fishing trip hacks, the best spots to go and most importantly how to thoroughly enjoy your trip with Apple Pie Moonshine, get out there and enjoy the rest of the summer while it lasts!